Image To ZX Spec 1.3.4 has now been released. Added VLC compatible video importing option. Added simultaneous video decode/spectrum encode. Added new prefer detail setting improving output. Added new Sierra error diffusion option. Added dynamic memory allocation (grabs as much free as possible). Removed some redundant localisation code. English text and licenses changes. Image to ZX Spec 1.3.4 Standalone (direct download, just unzip and double click jar file to start). Try Image to ZX Spec 1.3.4 online. Great software and nice to see an update. Kudos for using Atkinson dither. Well I did improve upon Atkinson ("Low Error Atkinson") especially for this program :) As for you problem - it seems that your browser is still using the default Apple version of Java 6 rather than Oracle's Java 7. The major.minor version error is caused by the fact that it was compiled for a later Java version. The cached error you also see is a consequence of not being able to load this code. Thanks for the reply. I've always used Hypercard for pixel art because of that reason :) HyperDither is a good OS X app to get around that, although I've never found a retro paint program better than the toolset in Hypercard... 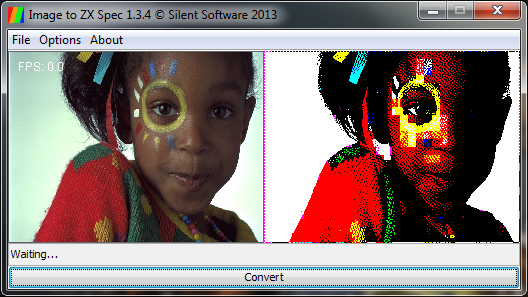 I was hoping to compare the 'contrast enhanced' filter in HyperDither to your implementation, but alas. and an Oracle launcher pops up when attempting the launch the web version. Safari is pretty strict about having the newest version installed. I don't know how to get around this! I don't know what to suggest as I don't own a Mac, perhaps the Oracle Java install page mentions something? You could always try the standalone version and see if that works or could use the command line if you get desperate "java -jar /path/to/jar/imagetozxspec.jar" if memory serves me. One suggestion, if you ever make a follow-up - either move the "convert" button to the top of the screen, or make it so that the window scales to 90% of the screen's vertical resolution. I find that if I process a large image the "convert" button ends up hidden underneath the taskbar. Apart from that it's ace!